One of my groups is ... spirited, let me say that. 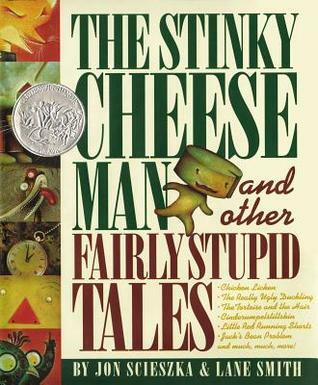 In March one of the most "spirited" kids in the group asked me to bring The Stinky Cheese Man and Other Fairly Stupid Tales, so I did, and all we read was stories from that book. I let the kids pick out which stories to read and I read the ones they picked out. We probably shared four or five of the stories from this collection and that was that. The Stinky Cheese Man and Other Fairly Stupid Tales by Jon Scieszka and Lane Smith. Viking Juvenile, 1992. This collection of fractured fairy tales definitely delighted the kids. They're silly and, well, stupid, and that was just what the kids wanted. The other group is generally very receptive to whatever I bring. These are kids who love books and stories and will sit through longer stories. I often bring some of my favorites from my childhood to share with them. But this month they were a little subdued when I came in. I don't know what was going on with them, but the only book they really responded to was Mo Willems, which is a title I've read to them before last year. Oh, well. Sometimes there are days like that! 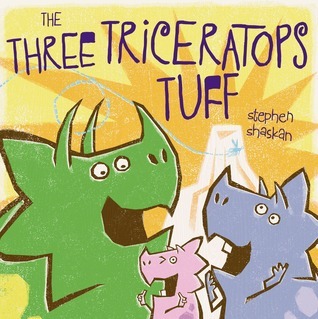 The Three Triceratops Tuff by Stephen Shaskan. Beach Lane Books, 2013. This is a retelling of The Three Billy Goats Gruff that would be great to pair with Mo Willem's Goldilocks and the Three Dinosaurs. It's not really a fractured fairy tale and not really as funny as Willems's title, but using some great dino voices can spice it up a bit. I love the colorful illustrations. 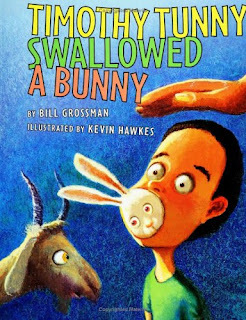 Timothy Tunny Swallowed a Bunny by Bill Grossman, illustrated by Kevin Hawkes. HarperTrophy, 1989. I saved this one from the weeding cart and chuckled to myself about the funny poems in this collection. I thought it would be great to share in celebration of National Poetry Month, but this group was maybe a little too young for it. I got mostly blank stares at the punch lines. Sigh. 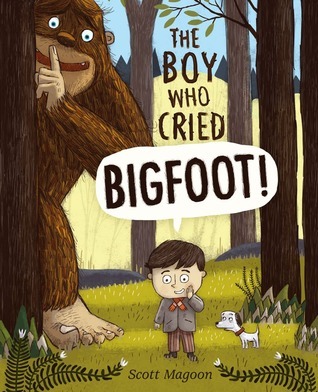 The Boy Who Cried Bigfoot! by Scott Magoon. Simon & Schuster, 2013. I guess fairy tale retellings were kind of my theme this month. This retelling of The Boy Who Cried Wolf is told from Bigfoot's point of view. The concise, funny text lends itself to reading aloud, although the illustrations are a little dark for large-group-viewing. 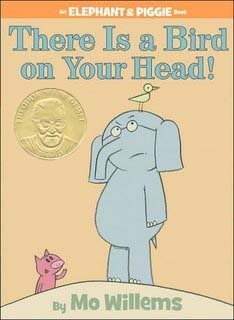 There is a Bird on Your Head by Mo Willems. Disney Hyperion, 2007. FINALLY A LAUGH. This is one of my all-time favorite readalouds and, honestly, this was the only one that the kids really responded to during my visit. I don't know if it's because they love Elephant and Piggie (they do) or if it's because it's a book I'm very familiar with and confident reading so I just read it better. But we went out with a bang, sharing one of our favorite books together. This month's craft was scratch-art bookmarks that I had leftover from last year. When they asked why I wouldn't be coming to visit them in May, I talked about the Summer Reading Club with my groups and encouraged them to all come and see me over the summer. And that wraps up my Afterschool visits for this school year! Any great ideas for books to share or easy crafts to do next school year?